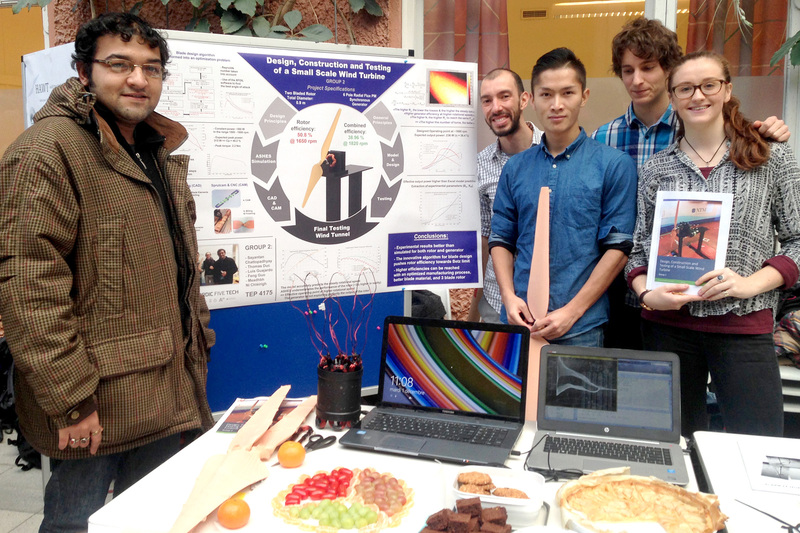 November 2015, students at the Master Program in Innovative Sustainable Energy Engineering (ISEE) won first prize for designing and fabricating a small-scale wind turbine and electrical generator. The competition was held among 130 students from both NTNU and a team from the Technical University in Berlin. The students were challenged to design and fabricate a small-scale wind turbine and electrical generator. The group with best efficiency measured in the wind tunnel was awarded the prize. This year students from the Nordic Five Tech Program won first prize, having the turbine efficiency higher than the NTNU teams and the TU Berlin team, who won the prize last year. The governmental proposes huge budget appropriations within renewable energy for 2016. In accordance with the governmental declaration the government suggests an additional strengthening of the research centers for renewable energies. Students from NTNU and Technical University in Berlin is already on it! This competition within the course divide students into groups of six pupils of varying backgrounds and academic levels, with the project of designing, simulating, constructing and finally testing their own small-scale wind turbine. The interdisciplinary Wind Turbine Competition is part of the course “Energy from Environmental Flows” with Prof. Dahlhaug in charge in cooperation with Dr. Paul Thomassen (firm SIMIS) Prof. Trond Toftevåg. The course includes students from a wide range of academic disciplines. The course gives students knowledge within advanced aerodynamics, electromagnetism and electro machine design. The Master’s program in Innovative Sustainable Energy Engineering is a collaboration between five of the leading technical universities in the Nordic countries (Nordic Five Tech) and University of Iceland (UoI). The NT-Faculty is hosting the Program. The program gives you a unique opportunity to tailor your degree based on your academic interests. You will get to study at two of the partner universities, spending one year at each. You graduate with a double master’s degree from the two universities. Innovative Sustainable Energy Engineering has an increasingly important role to play in order to ensure a sustainable future energy production. The program provides a state-of-the-art education in the fields of conventional and renewable energy sources like new power generation, solar energy, biomass energy, wind power, geothermal power, and energy utilization in the built environment by means of economically and environmentally sustainable systems and technologies. The students that won the competition are enrolled in the study track called “System Integration of Wind Power” which is a collaboration between Technical University of Denmark (DTU) and NTNU. Students study their first year at NTNU, then the second year at DTU. Meadhbh Ni Chleirigh , Electrical Engineer, MS. System Integration of Wind Power (MSISEE), NTNU, In the photo together with the rest of the team. The research led to the implementation of an innovative blade design algorithm, derived from an adaptation of the Blade Element Momentum (BEM) theory and taking into account the variation of Reynolds number along the blade. Using a 6 pole radial flux permanent magnet synchronous generator to convert mechanical energy from the rotor into electrical energy, the complete turbine reached a final efficiency of 38, 96 %. Testing their turbines this year, the students exceeded the expectations deduced from the in house turbine simulation software, Ashes. In particular, it has been found that the rotor efficiency exceeded 50 % in the region or operation around 1650 – 1750 rpm, confirming the relevance of this innovative design, and placing it firmly in the category of state-of-the-art rotor designs.